Oh my. It’s been so long. So much to talk about. I’m going to start with a piece shameless self-promotion. 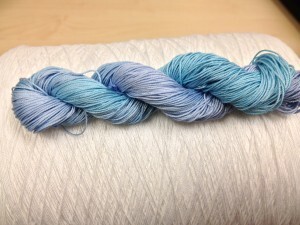 I am now starting to sell hand-dyed threads! I’ll be ramping up slowly over the next couple months. I’m getting a new custom-made adjustable swift for making the skeins next month which will help immensely. In the mean-time I’m winding some of smaller skeins. I’m excited about the swift because it will let me to make very long skeins so that the color changes can be very long and gradual. I tend to like the softer changes and so that’s what I’ll be dyeing. This blue and teal skein is one of a batch of only 4 skeins in Lizbeth size 20. 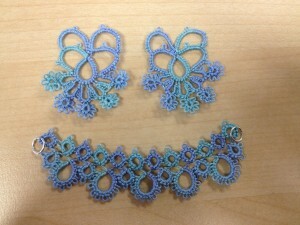 I love the colors and am excited about the mini-skein I saved for myself for tatting the samples. I’m calling it Sea Breeze. I’ll be posting a lot more threads as I make them. I wound some size 80 and King Tut too, which I’m excited to try soon. Any color requests? It’s going to be a while before I have a really good system down. Because every one of my batches is different and because I want to have a finished tatted sample to show the variations and color changes it my be slow going. Hopefully the final products come out great. In other news, I’ve got a new program set-up for diagraming patterns so I’m really getting going on the Priscilla project. I’m hoping to have a couple patterns all finished out (formatted and everything) by the end of the month. I went through the books and broke them down into what I think will make good separate volumes. If I go with that and don’t change anything, it makes for 14 volumes. This is going to be quite the project! I’m excited to finally be getting on to the production portion and past the research portion. In my personal life, I have a new bookkeeping client that’s going to end up being an additional 20 hours a week. I’ve enjoyed the extra time I’ve had by working part-time between the CPA exams and now, but it was time for me to pick up the hours to take my bookkeeping business up to a full-time job. I’m determined to keep making progress building a business out of Snapdragon Lace so stay-tuned for more exciting adventures in tatting!